Sec.Lopez started a solid professional economic, trade and industry development career in government from (1981-1993). Presidential Management Staff (1981), the Department of Trade and Industry (1982-1989) and NEDA (1989-1993). 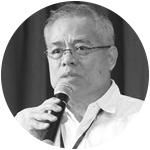 He has extensive experience in trade and industry development planning, at the forefront of the Tariff Reform Program, Industry development programs, setting up of ASEAN and APEC cooperation programs, technical studies on Countervailing Duty cases, critical consumer products’ price structures and the development of the Foreign Investment Act. This included policy and program development, and project evaluation functions. This was followed by a continuous career in the business sector (1994-June 2016), with over 22 years of experience, having been a top executive of RFM Corporation. Simultaneously, he has been the Executive Director of the advocacy group Go Negosyo for the past 11 years (October 2005 – June 2016).